Summer is here, and it's hot — so what do we need? Something cold to drink. 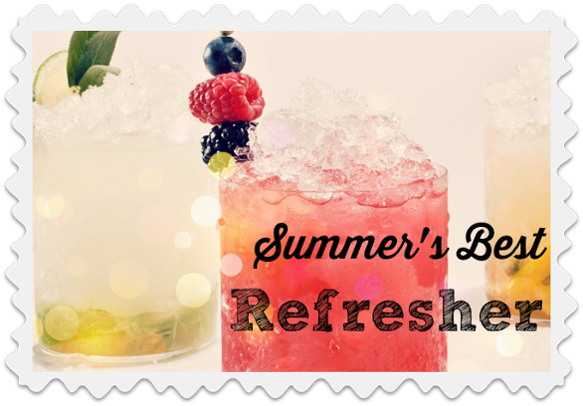 Here are some of our favorite summer drink recipes. Some are fast and classic, some are quite luxurious and need a little bit of patience. But they’ll all make you feel refreshed and ready to enjoy every second of your Summer. Pitchers ready? Here we go! Simply mix together all four ingredients in a blender. Pour into ice-filled cocktail glasses. Want alcohol? Add white rum! Muddle watermelon and agave syrup. Add the rest of the ingredients. Shake well. Double-strain into waiting glasses. Use a watermelon slice as the proverbial umbrella! With the mint leaves at the bottom as the bed of the drink, muddle the crushed ice, rum, sugar and lime juice. When you’re done, add the soda water and plop more mint leaves on top! Muddle the berries and citrus in the shaker. Add the simple syrup and shake four to five times. Add the vodka. Strain into an old-fashioned glass. Plop crushed ice in there to the halfway point. Stir, and then top with more ice. See? A snow cone! Garnish with berries! Chop cantaloupe up and puree slices in a blender until smooth. Set a fine-mesh sieve over a large bowl. Add cheesecloth to this sieve. Strain the puree into the bowl. Repeat this with new cheesecloth in a pitcher until you have enough juice for 5 cups. Add 3/4 cup lemon juice, 3/4 cup basil leaves and 2 cups of cold water to the pitcher. Steep this for about two hours. Serve your agua fresca in ice-filled glasses. Aaahhh. Remove the peach pits, cut into wedges, and just place the peaches, thyme and moscato in a large pitcher. Stir and then leave it for at least four hours to let the flavors blend and infuse. Overnight is best. Pour in the sparkling wine or champagne into the pitcher just when you’re about to serve and stir. Pour your peach and thyme sangria over ice and garnish with fresh thyme and peaches. Have fun playing with these recipes and beat the heat with these refreshing ideas for wonderful drinks!